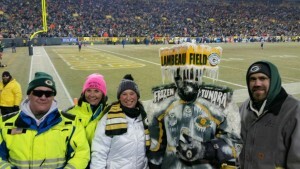 Last week we kicked off making wishes come true in the playoffs hosting warriors in the “Frozen Tundra” of Lambeau Field! 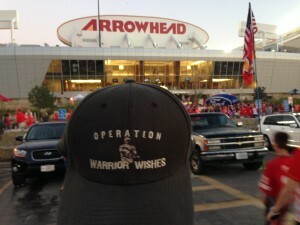 This week we are honored to be hosting Marine CPL Christopher Lee at his first ever Kansas City Chiefs game! 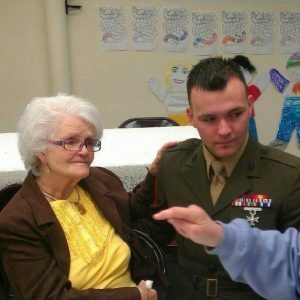 Marine Cpl Christopher Lee served 9 years with deployments to Iraq, Afghanistan and Korea. He was nominated by his stepmom and dad. For the second straight bad weather prevented my dad from being at the game to personally host Cpl Lee & his father at Arrowhead stadium. 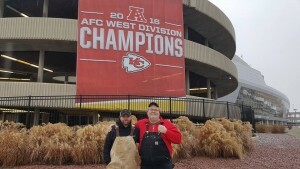 Despite the fact that the National Weather Service was calling a threat of severe Ice storms throughout the Kansas City area, Chris & his dad braved the weather. Thankfully, the NFL changed the time of the game from noon to 8:20 & hoped that the ice storm will have already passed thru the area. Their plan worked perfectly! My dad did his famous “radio show contest” to surprise CPL Lee with the playoff tickets. His stepmom said she wish she had his reaction on camera. Needless to say, Chris was very excited and We think his dad was just as excited when his son asked him to go with. We have said it before and will say it again. we love the father-son experiences the best for obvious reasons. There is nothing better than seeing a father and son get to experience their first game ever together! Those memories last a lifetime! Fortunately, the weather never got as bad as they thought it was going to be. It rained most of the morning but was not cold enough to freeze over. It gave Chris & his dad time to get to The stadium early to experience some Pre Game activities. The Chiefs played well all season long. They clinched their division & a first round bye in the final week of the regular season. The only problem is that they were facing a red hot Steelers team who has looked unstoppable over the past few weeks. Earlier in the season, the steelers steamrolled the Chiefs 43-14. 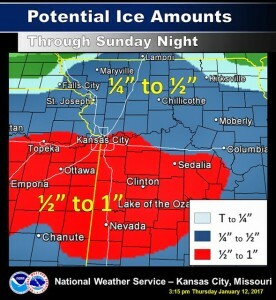 Thankfully the Chiefs did not get blown out this time. In fact, the Chiefs did not allow a Touchdown the entire game! Unfortunately A 4th down penalty Late in the 4th quarter with the Chiefs up 16-15 cost them the game… The Steelers went on to win 18-15 by scoring 6 field goals in the game. 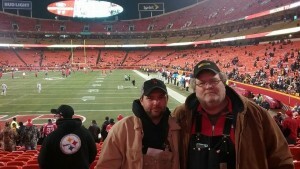 Despite the tough loss, Cpl Lee & his dad said they “had the time of our lives. Scott told my dad that the time he spent with his son was “so special.” We do our best to make sure that EVERY “Warrior Wish” is memorable and special, and love to hear that it was! 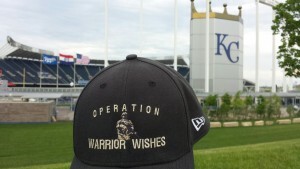 Since we were not able to personally host Cpl Lee and his dad, we will be inviting them to the Royals game this summer on our Battlefields to Ballfields Mission. We want to thank CPL Christopher Lee for his 9 years of selfless service & sacrifices to our country. We are glad you had a good time with Dad! 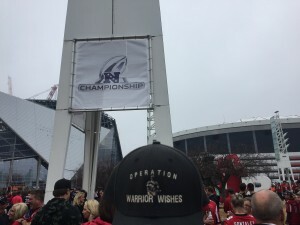 Next week, weather permitting, my dad will be back in action making Warrior Wishes come true at the NFC Championship Game in Atlanta thanks to the Falcons! Stay tuned for more details!